For a while now, I’ve been wanting to use muffin pans to make brownies. I found several recipes, but none I could really get excited about. Then, I found this one that features one of my favorite combinations: chocolate and peanut butter. 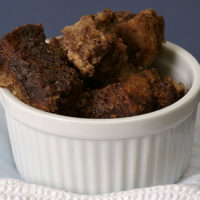 The brownies are prepared in traditional brownie fashion, but scooped into muffin tins like cupcake batter. Instead of the swirled chocolate/peanut butter chips, I used a combination of chocolate chips and peanut butter chips in the batter and also on top. I actually think I like the look of the different chips better than I would the swirled chips. Either way, they are sure to be fabulous. I really love the dollop of peanut butter in the center. I put the warm peanut butter in a zip-top bag, cut a corner off, and piped it inside. 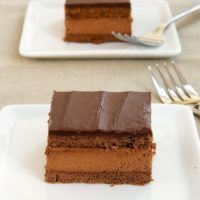 For an even more decadent treat, I think you could also pipe in some melted chocolate, creating a chocolate/peanut butter melty, gooey center. We found these to be best served warm. 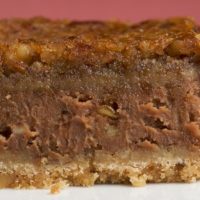 The edges are nicely chewy and the inside soft and gooey. I wish I could find adequate words to express how good these really are. Quinn said that they are one of his favorite things I’ve ever baked. With almost ten years of my baking for him, I think that says it all. 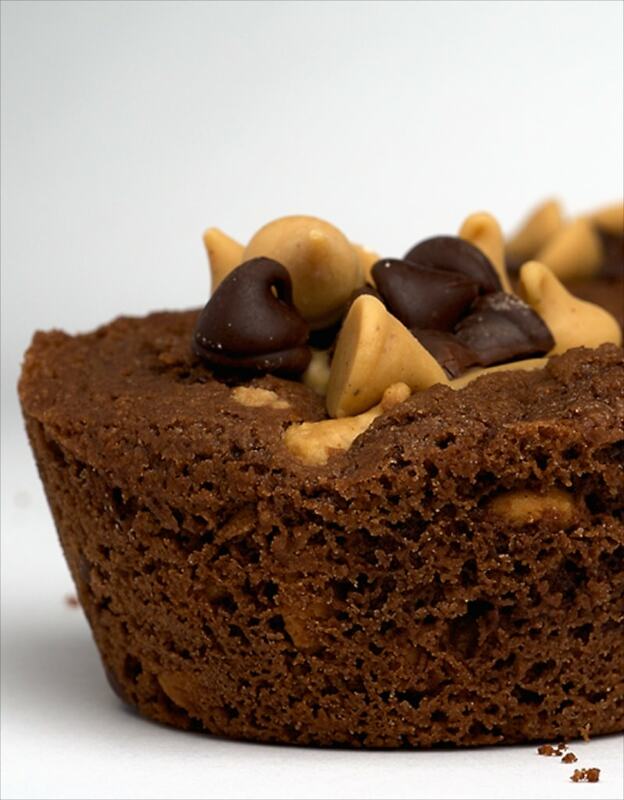 Brownie Peanut Butter Cups are rich brownies filled with sweet, gooey peanut butter and chocolate. Preheat oven to 350°F. Spray or grease 12 muffin cups. 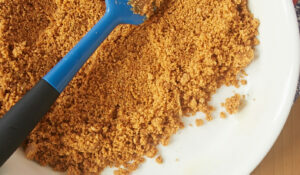 In a large microwave-safe bowl, combine the sugar, butter, and water. Microwave on high for 1 minute or until butter is melted. Stir in 3/4 cup semi-sweet chocolate chips until melted. Stir in the egg and vanilla extract. Add the flour and baking soda, stirring until blended. Allow to cool to room temperature. Stir in 1/2 cup each peanut butter chips and semi-sweet chocolate chips. Spoon the batter by heaping tablespoonfuls into muffin cups. Bake for 13-15 minutes or until the top is set and a toothpick inserted into the center comes out slightly wet. Place the pan on a wire rack. The centers of the brownies will fall upon cooling. If not, tap the centers with the back of a teaspoon to make a hole. Place the peanut butter in a small microwave-safe bowl. Microwave on high for 45 seconds, then stir. 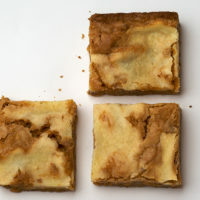 While the brownies are still hot, spoon about a tablespoon of peanut butter into the center of each brownie. Top with semi-sweet chocolate chips and peanut butter chips. Cool completely in pan. The brownies look absolutely delicious! I want to reach out and grab the last picture… soooo good. I love chocolate and peanut butter… just made chocolate cupcakes with peanut butter frosting recently. Hands down one of the best combinations ever. I think I’ve gained weight just by looking at that last gooey shot though. Yum! I love making brownies in muffin cups. It is just so much easier than dealing with a big pan and cutting. Plus, they pack better. Your brownies look absolutely amazing! So good! wow wow wow…triple wow! they look like a muffin (i adore) they are brownies ( i adore) so combine them..you get heaven!!! thanks for the great tip and stunning photos!! I agree they look wonderful. Do you use regular size muffin tins or mini muffin tins? I’ve never though of using tins before but its a great idea…I’m going to try it next time I make brownies. This is a great idea–especially for someone like me who likes the corner pieces of brownies better than the pieces from the center of the pan. YUM! I saw these on Tastespotting and had to see more 🙂 I love baking brownies in muffin tins but last time I used liners so it was more like a cupcake. Putting them directly in the muffin tin would sure end up in a better crust. I’ll have to try this soon! I have tried brownies in muffin tins before and they always stick to the pan, but I think I’ve always used a box mix (shhh). I can’t wait to try this recipe! Your photography is divine! those look too good to exist! Every time you post I know I am in for an over-the-top delicious post…and these brownie peanut-butter cups did not disappoint at all. They look soooo good! Can’t go wrong with that combo all nestled in a brownie! Chuck, I’ll take one of those cupcakes, please! Dayna, it’s definitely one of my favorite combinations. Maybe in my top 3. Holly, it is much easier to make brownies this way. I can’t believe I haven’t done it before. Hallie, these were made in regular sized muffin tins. Sharon, I debated using liners for these, but in the end I’m glad I didn’t. They came out cleanly and the edges were baked just right. Thanks, Katrina! Let me know what you think of them if you make them. DessertObsessed, I assure you that they do indeed exist. Or, at least they did before we ate a couple and gave the rest to my sister and her husband. vldreyer, that about sums it up! My Sweet & Saucy, thanks so much! megan, I completely agree. Yum! Those look awesome, I’m definitely making me next brownies in a muffin tin! What a great idea to bake brownies this way! I love the crusty part best, so this is perfect for me. They look awesome! I made these today and used the Swirl PB/Chocolate chips as that is what I had, I also used milk chocolate chips, just for the decor as I like milk chocolate and PB better, but I used semi-sweet for the brownies, and mine aren’t as pretty as yours, but they taste darn good. Will try to post my picture on my blog soon. Your pictures are just amazing, and these are delicious. The PB goo in the middle is amazing, too. Look at all of the chocolate and peanut butter chips in them!!! They look great! Jennifer, I just have to say, whenever I’m in the mood to bake some delectable homemade treats for myself, my husband and the kiddos, I always check Bake or Break before proceeding. 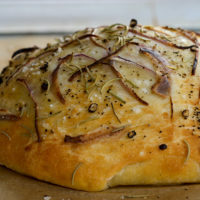 You always have such great ideas, mouthwatering photos and the recipes are typically something I can whip up in a flash. My sweet tooth family thanks you and so do I! 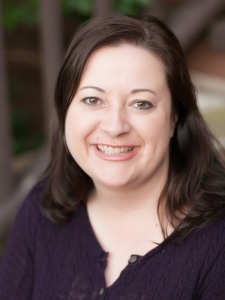 Sarah Bell, thanks so much! Susan, I think lots of people prefer the crusty parts of brownies. These are great for that. Katrina, I’m so glad you liked them! Thanks! Sandie, you are so sweet. Thank you so much! Oooo, I bet those are good served warm and gooey… with a scoop of vanilla ice cream too. I like the idea of adding a chocolate filling with the pb. Yum, yum and more yum! These are best served warm. We even put some vanilla ice cream on the side as if the brownies were not sinful enough alone. Jennifer, these are great! Thanks for letting us try some of these. We have only one more left, so it will be interesting who will end up with it! Rachelle, that’s about the only sound you can make while eating these. Nan and Jim, glad y’all liked them. I knew Jim would for sure! Indigo, I’ll take that as a compliment! these served warm like you say… delicious! so gooey… the chocolate with salty pb…. oh man! Decadent! I love those! Don’t worry, the pictures do convey how good these must be!! wow, these taste as good as they look. Eat them warm with Pistchio Gelato. Ooo those look so very delicious. I must make those for the peanut butter chocolate lovers in my life! Cindy, I think you’d like them. Let me know what you think! emma, I think the mini versions would be wonderful. Ashley, I’m sure those folks will be very grateful! I just made these tonight and man they are amazing! I think that I have found the perfect dessert. Oh wow, those look amazing! My mom used to bake brownies in muffin tins all the time–she was a huge fan of brownie edges, hehe. Awesome Mom, I’m so glad you liked them! Thanks, Elle! These brownies definitely have good edge: brownie ratio. These look so amazing…we don’t have peanut butter drop here sadly! They remind me of my hokey pokey peanut butter & chocolate cups I made yesterday, I just put the post up. Sharon, I’m glad you liked them! Peanut butter and chocolate, it’s to die for! these look fantastic! Oh those look divine! Peanut butter is my favorite. Can’t wait to try this for myself. Lynn, I hope you like them as much as we did. Samantha, thank you and welcome! Glad you found me. I just stumbled your blog in Firefox and came to this recipe. These look absolutely incredible, what else could I possibly say! Can’t wait to have a closer look around the site and try some of the recipes! Debra, I’m glad you found me! Welcome! oh incredible looking brownies. this is simply gorgeous and perfect for me and soeren to make together! thanks for this! Meeta, I hope you like them as much as we did! I made these too, and while they don’t look nearly as good as yours, they taste delicious! Just… wow. Did the chocolate/peanutbutter chips stay well suspended in the batter? I’ve found in the past that they can sink too the bottom and burn, so I often use the mini chips or chop the chips up into finer pieces. These look delicious! Thanks, Hilary. I’m glad you liked them, too! A, the chips didn’t sink to the bottom at all. This is a nice, thick batter so that helped. I stumbled across your blog and the first thing I saw was this picture…yummy. I just took mine out of the oven and can smell the chocolate and peanut butter..Can’t wait to try them. Susan, I’m glad you found me and my blog. Hope you enjoy the brownies! Wow! Taking them to a retirement luncheon for dessert! I’ve already copied the recipe – they will be begging for it after one bite! Mumsy, they are sure to be a hit. So, so good! Wow, those look absolutely delicious! 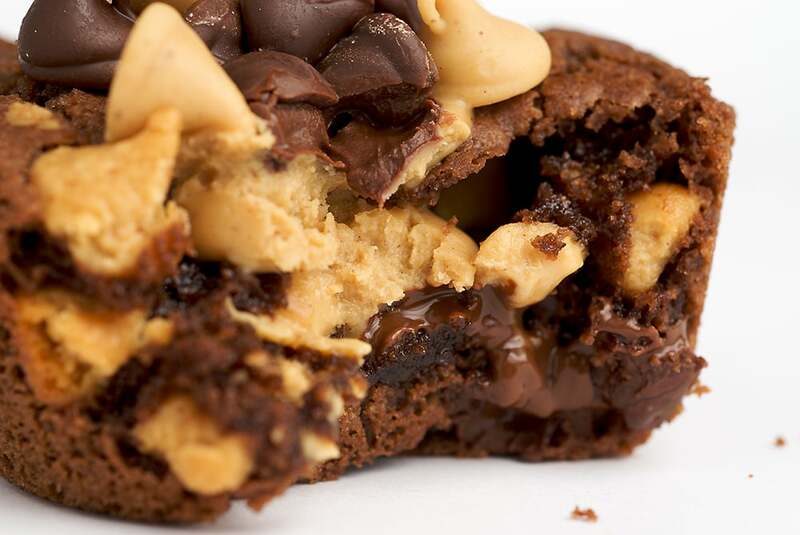 You just can’t go wrong with chocolate and peanut butter. Thanks, Kham! I totally agree. Wow they look amazingly good. I don’t think there’s any problem with saying they’re good to eat warm as I’m one of those people who can’t resist eating cakes as soon as they appear out of the oven! Diane, that’s the very best way to eat them! Hi, I just made these for a little party I’m going to tonight. They turned out fabulously, though I put the peanut butter on top instead of inside for the “peanut butter cup” effect. I’m going to warm them up right before serving, I think they’ll be a huge hit. Thanks! Stephanie, I’m sure they will be well received. Have fun! My mouth is watering just looking at the pictures – simply brilliant! Just recently, I made brownies in mini muffin tins for a party and put a Hershey’s chocolate kiss in the center prior to baking. It comes out as a gooey center and will stay soft for awhile (they haven’t stayed on the plate long enough to find out exactly how long). However, I’m told that if they’re reheated for a few seconds in the microwave, the kiss melts again for that yummy melty chocolately goo we all love. I’m definitely going to try mixing with the peanut butter center and mixture of chips. Thanks! Lisa, your brownies sound delicious! I re-heated these and that peanut butter center just got gooey all over again. Yum! 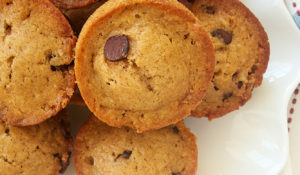 Oh, I just made these in a mini-muffin pan.. they’re awesome! Thanks for yet another great recipe! Yummy!! These look scrumptious. I need to make this but the whole tray will probably be gone in five minutes knowing my girlfriend and I. Just baked a batch of these today, and they are truely delicious! Alicia, I must try these in mini-muffin size! Scott, I’m glad you liked them! when i tried making these, i took then out of the oven to cool, and there became huge gaping holes in the center. Sunishchal, that’s exactly what they’re supposed to do! Then, they get filled with warm peanut butter and topped with chocolate and peanut butter chips. These appear to be worth the health risks. omg those look so good! i’m going to try making them this weekend. thanks for the tip! BetterRecipes, I hope you enjoy them! Dragon, I think that’s the first time I’ve heard the term “fell in food love.” Certainly appropriate for these, huh? I couldn’t wait until Sunday to make these. 🙂 Also, I couldn’t wait until they were completely cooled down either. I love these! Would this recipe work with a mini muffin tin? I think I might add a little espresso powder next time (and by next time I mean tomorrow). I think it does wonders for the taste of chocolate. Dragon, I’m glad you liked them! Some other people left comments that they had success making these in mini-muffin pans. Enjoy baking them again! Let me know how the espresso powder works. I made these in a mini cupcake pan (sprayed with Pam, no paper liners). I got 40 brownies from 1 recipe, using only 1/2 cup total of peanut butter for the centers, and as many chips that would fit(about 6 to each brownie.) 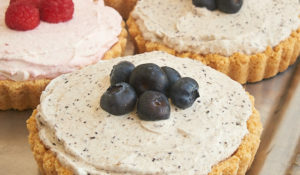 They were part of Father’s Day snack sampler I did up for work and were a huge hit! Carol, I like hearing all the good results everyone is having with these. Glad they were a hit! Just made these yesterday and they. are. incredible. INCREDIBLE! Super easy, very impressive-looking and awesomely delicious. …forgot to mention: I made them in a mini muffin pan sprayed with Pam and I got about 20 or so using a cookie scoop to scoop out the brownie “batter” (more like dough). Carol must have made tiny ones! I made these over the weekend for company and everyone LOVED them! Thanks for the fabulous recipe!! Jill, I can’t believe how much everyone is loving these. Actually, I can – they were so good! I’ve been sitting on this recipe waiting for the right occasion to make it, and decided my favorite coworkers birthday would fit the bill. Simply put, they are amazing. Thanks so much for posting this! PB and chocolate is my favorite sweets combination, and these are magnificent. grill, these are definitely worth delaying a diet. That last picture has me drooling! You had me at hello!!! Those look divine – wonderful pictures, I’ll be right there – LOL! Thank God for StumbleUpon!!! Thanks, RH! I’m glad StumbleUpon led you here. Welcome! Love this brownie recipe. I made it today and everyone loved it. YUM, YUM, YUM!!! I’m going to try this (just printed the recipe), but I am going to use a mini-muffin tin (mostly because I have one and it doesn’t get used very often). Made these for mother’s day at my mom’s request. They were awesome. I’ll have to make more for myself. Thank you! These just saved me from some birthday eve angst.I’m turning forty and having some of these tasty nibbles helped ease the pain a little. Delicious! Can’t wait to try some more of your yummy recipes! Made these last week and they were DELICIOUS. I had to send them with my hubbie to work because I wanted to eat all of them. We used the “peanut butter” (crushed honey roasted peanuts) from whole foods, and it totally made these. 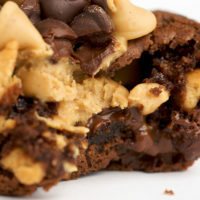 The slight crunchyness and saltiness of the peanut butter accented with the rich chocolate brownies. WOW! I went on a baking spree the other day and these came out FANTASTICALLY. Which is really saying something because this is the first time I’ve ever successfully baked anything from scratch without some kind of catastrophe lol. just came across your blog……and boy, am I glad I did! 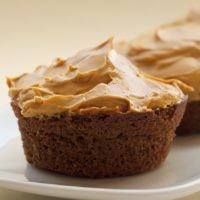 this recipe will delight my PB lovin’ 12 year old son. Birthday Brownie-cakes comin’ up. Just wondering if the brownies are prepared fudge style or cake-like? Does it matter? I’m planning on making them tonight! Help! Thanks! Jobiwan, if memory serves, these are a bit on the dense side to hold up to all that filling. If you follow the recipe, they should be the right consistency. Enjoy! Isn’t the baking powder a bit too much if I’d like to have a chewy and fudgy brownies? Can I lessen the amount of it? Your photos look amazing! Thanks. Ram, because these are not your traditional brownie presentation, I’d be reluctant to tinker with the recipe too much. These have to be able to hold all that filling and topping. To be honest, I was not that impressed UNTIL i saw the picture of the insides of the brownie. After I saw that I was convinced that I need to make this! Brownies with a different twist! Will have to try! Aaahhhh…yeah I’m try this one!!! Looks delicious!!! I wish there were more instructions….. like, did you measure the chips you added to the batter or just toss some in? Did you bake the brownies with the chips on top or did you add them afterward while the brownies were still warm? I’d think baking the brownies with the chips on top would melt them? Michelle, the recipe has all the details. The link is above the top photo. A second on the lips, a lifetime on the hips. Heck, this is worth it! I will be making these……..TODAY.